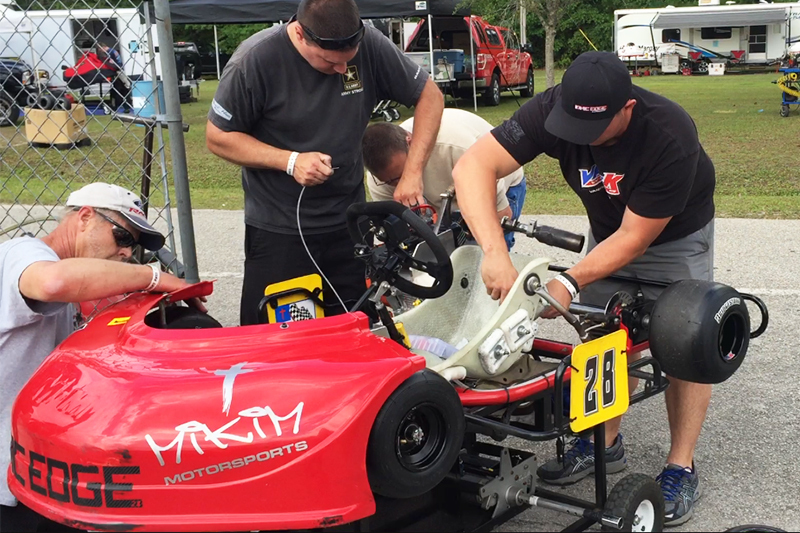 April 19, 2016 – The IONIC Edge Chassis team traveled to Jacksonville, Florida, this past weekend for the much-anticipated season opener for the WKA Gold Cup Series at the popular 103rd Street Sports Complex. 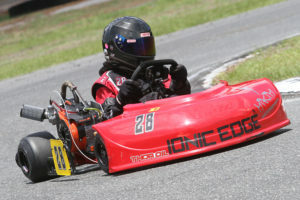 Seven IONIC Edge teams made the trip south to Jacksonville, where Junior Sportsman racer Aiden Baker Crouse rode his IONIC Edge to an unprecedented seven feature wins in all seven classes he entered. With three Sportsman classes offered each day, plus the special 10-lap Shootout race Saturday night, Crouse entered every division in the age category and opted to race his 2015 IONIC Edge kart in each class. The decision turned out to be a good one as Crouse turned the septenary, sweeping every round of competition in the seven classes in a truly dominating weekend for the North Carolina driver. Crouse opened the weekend with a sweep of the Sportsman Pro Gas Animal Lite division, capturing the pole award and winning both the heat and main event. On Sunday, he would back up his impressive Saturday performance with another clean sweep of the division with the Pole Award, heat race and feature win. Crouse’s team, led by his father, Jason, and IONIC Edge Chassis owner Kyle Luttrell, would change their kart’s engine, tires and weight from the Pro Gas Animal to the Sportsman LO206 all weekend. Jason had the important task of swapping the engine. “It really wasn’t that hard to swap the engine with the new innovative IONIC Edge motor mount,” Jason said. Aiden’s grandfather, Terry, and Johnny would race to swap all four tires before Jason could change the engine. Kyle had the important job of adding and taking the weight off. By the end of the event, the team had perfected the changes, making the swaps in less than four minutes between races! The hard work proved to be worth it as Crouse won every round of competition between Saturday and Sunday’s Sportsman LO206 contests. Aiden would qualify P1 both days and win each day’s heat races and main events in the 206 division, crossing the finish stripe nearly 8 seconds ahead Saturday and over 3 seconds in front on Sunday. Crouse closed each day’s racing with wins in the Sportsman Pro Gas Animal Heavy class, scoring a 3-second win Saturday and a closer 0.697-second triumph on Sunday. Congratulations to Aiden Baker Crouse on an outstanding performance at arguably the most competitive Gold Cup event of the year. Aiden also was honored at the 2015 Gold Cup Series awards banquet Friday evening, where he was presented three national championship trophies for his trio of 2015 class championships in the series! 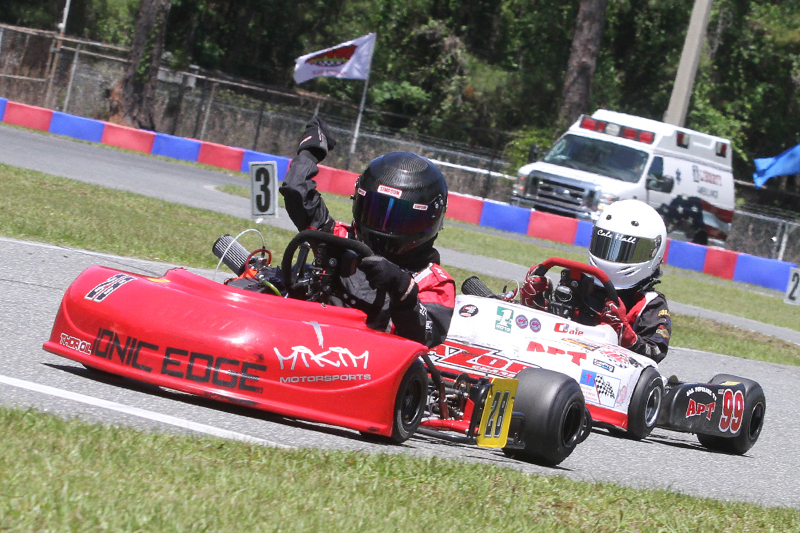 Four drivers entered Junior competition at the Gold Cup Nationals in Jacksonville. Brian Van Cleve Jr. and Alex Vrabel tried their hands in Junior Pro Gas Animal Lite and Heavy while Andrew Willis and Brian Collins competed in the Junior LO206 category. Van Cleve had the best weekend of the four, never finishing outside of the top five in the four Junior Pro Gas main events. His best race came in Sunday’s Junior Lite final, which saw him finish a close second in the 12-lap main. Van Cleve also netted finishes of third in Saturday’s Junior Lite and Sunday’s Junior Heavy finals. He added a fifth-place result in Saturday’s Junior Heavy main event. Vrabel scored a pair of top-five results. The Ohio driver and former multi-time Gold Cup feature winner ran fourth in Sunday’s Junior Heavy main and opened the weekend with a fifth-place finish in Junior Lite on Saturday afternoon. Van Cleve and Vrabel also finished fourth and fifth in Saturday night’s Junior Shootout special event. Andrew Willis brought his sharp new IONIC Edge to Jacksonville and scored a fifth-place finish in Saturday’s Junior LO206 final. On Sunday, Brian Collins raced his IONIC Edge kart to a fifth-place result in the Junior LO206 weekend closer. Matt Skaggs was one of the stars of the new LO206 Masters division. Skaggs, who’s been racing all over the country over the last month, scored the Saturday’s Pole Award in the Masters class and crossed the finish line first in a hotly contested 12-lap main event. However, Skaggs was DQ’ed in post-race tech for using the wrong spark plug washer. Skaggs returned Sunday to finish third in another close Masters contest. Ohio’s Dustin Demattia raced Senior LO206 at Jacksonville and netted a pair of top-10 finishes in the event’s largest division. Demattia would round out the top 10 Saturday and improve Sunday to take seventh in the Senior 206 main. “I’m really proud of all our guys,” IONIC Edge Chassis owner Kyle Luttrell said. “It’s hard to put into words what Aiden Baker Crouse accomplished. He’s such a great and focused kid, and he made us so proud with seven wins and a sweep of the entire Sportsman category. I can’t remember anyone ever winning seven races at a Gold Cup, and to do it all on the same chassis with changing the motor and tires all weekend made it even more special. After the first of four rounds IONIC Edge leads the 2016 Gold Cup Series Chassis Manufacturer standings with six wins, one better than the next closest chassis builder. Next up for IONIC Edge Chassis and Luttrell Racing is the AKRA Southern Tour Round 2 coming up April 29-May 1 and the historic Lamar County Speedway in Barnesville, Georgia. For more information, visit the new ionicedgechassis.com and contact Kyle Luttrell at kyle@luttrellracing.com or 404-516-8934.